That's saying something given that King is, well, the King of Nightmares. It turns out that he was truly shaken up by the death of the late, great Jack Ketchum, born Dallas Mayr, due to cancer. Not a great way to go and cause for despair and desolation, especially among the kindred. Ketchum died at the age of 71. Too soon. It wasn't like this was a light loss either. 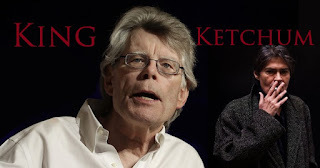 We can only imagine of the day when Stephen King departs into the shadows from whence he came. Until that dark day, we watch our masters of the demonic written word grow older into decay. However, the good news is this: we still have classics from the man himself, Ketchum, from his 1980 debut OFF SEASON to freakish stories like SHE WAKES, COVER, ROAD KILL, ONLY CHILD, LADIES NIGHT, and chilling novellas collected in his published TRIAGE work. He may be gone, but as Luke Skywalker would say.... "No one is ever really gone."